Representative Honours: Northern Ireland: 10 Full Caps (1987-1989), 1 Under-23 Cap (1990); Hong Kong League XI. Club Honours: (with Chimney Corner) IFA Intermediate Cup Runner-Up 1980/81; (with Distillery) Co. Antrim Shield Winner 1985/86; (with Albion Rovers) Lanarkshire Cup Winner 1986/87; (with Celtic) Scottish League Champion 1987/88; Scottish Cup Winner 1987/88; (with Collier Row) Isthmian League Division Three Champion 1994/95; (with Romford) Essex Senior League Champion 1995/96; (with Collier Row & Romford) Isthmian League Division Two Champion 1996/97. Romford FC merged with Collier Row FC in 1996 to form Collier Row & Romford FC, taking Collier Row’s place in the Isthmian League. Allen "McKnightmare", as he would later cruelly be dubbed, came to become a goalkeeper by sheer fluke. As a 16 year-old he was playing as a strapping centre-forward for Crumlin Boys when he took the 'keeper gloves when the regular custodian was unavailable. He did well, and over the following years graduated to Crumlin Rec. in the Amateur League then to B Division Chimney Corner. He played for Chimney Corner in a 4-0 Intermediate Cup Final thrashing by Newry Town - it could have been double figures if not for the agility of McKnight, a fact noted by Newry manager, Roy Welsh. When Welsh became boss at Distillery he called on McKnight during an injury-crisis. Whilst at Ballyskeagh he helped Distillery to win the Co. Antrim Shield, and after a total of 68 appearances signed for Celtic in the summer of 1986, following closely behind Anton Rogan. On arriving in Glasgow, McKnight found himself as third choice 'keeper behind Pat Bonner and Peter Latchford, and he was farmed out on a season-long loan to Albion Rovers. His time in the Scottish Second Division earned McKnight valuable experience in the Scottish game, and also a Lanarkshire Cup winner's medal. On his return to Parkhead for the 1987/88 McKnight found a new manager, Billy McNeill having replaced David Hay, and quickly found himself in the first-team as Bonner went down with a virus. McKnight's debut came in a 5-1 League Cup win at Dumbarton on 26th August 1987. Three days later he made his Premier Division bow, keeping a clean-sheet in the heat of an Old Firm derby, Celtic beating Rangers 1-0. Ultimately Bonner reclaimed his place, but McKnight's twelve appearances and five clean-sheets helped the Championship trophy return to Parkhead. 1987/88 also saw Allen McKnight make his international debut, displacing George Dunlop for the European Championship qualification match with Yugoslavia in October 1987. He played every minute of that season's internationals, six in all, and kept clean-sheets against Turkey, France and Malta. The highlight of McKnight's season was yet to come, Pat Bonner picking up calf and hamstring injuries in training just days before the Scottish Cup Final. Billy McNeill kept the Republic of Ireland Number One's injury a secret right up to Final Saturday, with the Northern Ireland man a surprise between the sticks. Celtic claimed the trophy, and the Double, with a 2-1 victory over Dundee United, but it was McKnight's poor clearance that allowed Kevin Gallacher in for United's consolation. In July 1988, with Pat Bonner still Celtic's obvious goalkeeping choice, McKnight jumped at the chance to play topflight football in England, with West Ham United manger John Lyall offering £250,000 for his services. Having expected to be little more than back-up for veteran Phil Parkes and established reserve Tom McAllister, McKnight made 23 League starts in his first season at Upton Park, as Parkes suffered long-term knee problems and McAllister broke his wrist after just two games. West Ham were struggling, and despite clinching a 1-0 over Wimbledon on McKnight's debut, further injuries to key defenders and a lack of goalscoring strikers saw the club win just twice more up to Christmas. High profile mistakes by McKnight in the televised Boxing Day clash with Norwich, when he was beaten to a through ball by Dale Gordon who slotted home from a tight angle, and again in January's FA Cup third round clash with Arsenal, with Paul Merson beating McKnight softly at the near post to spur an Arsenal comeback from 2-0 down were pounced upon by the media and West Ham fans alike. Performances such as the one he put in to keep Coventry at bay until they scored a late equaliser in November, and in impressive League Cup wins over Derby County (5-0), Liverpool (4-1) and Aston Villa (2-1) were quickly forgotten when McKnight was held responsible for two of Luton's goals in a 3-0 semi-final defeat, and a half-fit Phil Parkes was recalled to the goalkeeping position in February. Only when Parkes' injury became too much for him to continue was McKnight recalled, making his final League appearances for the Hammers in a 2-1 win over Nottingham Forest and the 5-1 defeat by Liverpool that confirmed relegation on the final day of the 1988/89 season. Through 1988/89 McKnight made it ten consecutive appearances for Northern Ireland. His heroics in a 0-0 draw with the Republic of Ireland earned him high praise from one of his illustrious predecessors, Pat Jennings noting, "Allen has come on leaps and bounds. He made no less than six saves which could otherwise have been goals. I was very impressed." Sadly the knocks to confidence from his club-career saw him dropped in favour of Tommy Wright with the criticism of Billy Bingham ringing in his ears, "If he has a fault, he does not know when to commit himself." 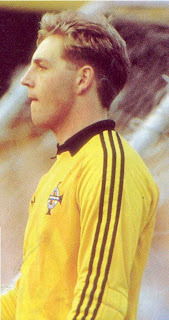 McKnight remained in the Northern Ireland squad into 1990 as goalkeeping cover, but the emergence of Paul Kee pushed him even further down the pecking order. McKnight's final appearance in a Northern Ireland shirt came in May 1990 when he played in the 3-2 Under-23 defeat by the Republic of Ireland. John Lyall was sacked following West Ham's relegation and almost imediately his replacement, Lou Macari, took a dislike to McKnight, and over the next two seasons he made just one more competitive appearance, in a disastrous 5-1 ZDS Cup defeat by Luton. In 1991 McKnight was released by West Ham and was left with the difficult task of finding a new team after two seasons with virtually no football. He embarked on a footballing journey that took him briefly back to Scotland, around England and on to the Far-East, were he picked up titles with South China Athletic Association in Hong Kong and represented the Hong Kong League in the annual Carlsberg Cup. McKnight made his final League appearance, as a non-contract player for Exeter City, in a 4-1 win over Burnley in May 1994. The 1994/95 season saw McKnight turning out in the Isthmian League with Collier Row, clinching the Division Three title before moving on to Romford in 1995. Once again he clinched a League title, this time the Essex Senior League, and the following season another one (this time for the newly merged Collier Row & Romford) in the Isthmian League Division Two. McKnight's time with Romford was punctuated by his eccentric performances, scoring from a clearance in a cup match with Barking, and also making an attacking impact on a number of other occasions when playing upfront following injury or whilst seeking late equalisers. A knee injury effectively ended McKnight's career in 1997. Summary: 10/0. Won 2, Drew 3, Lost 5.